There are some toys and gear that I think of as necessities for children. Not the elaborate and intricate ones (even though those are fun), but the ones in which childhood would simply not be the same without them. Dolls. Cars and trucks. Books. Crayons. And building blocks; every kid needs a great set of building blocks. The traditional sets of blocks are always wonderfully classic and provide endless possibilities in terms of imagination, small motor skills, and learning the science of balance. But when it comes to taking something great and making it even better? 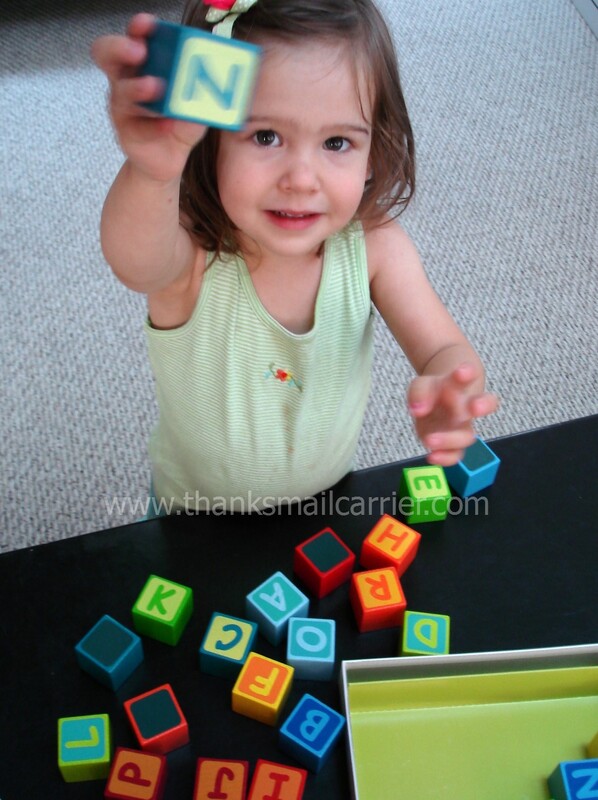 That's where HABA comes in and turns regular blocks into something so much more with their Building Blocks First Letter Fun. Chances are that if you've read past reviews here, you've seen a mention of the incredibly high quality, eco-friendly children's toys from HABA. As the recipients of almost every toy award that exists, they carry everything from furniture to toys to accessories (and more) for children of all ages to help them learn and grow. 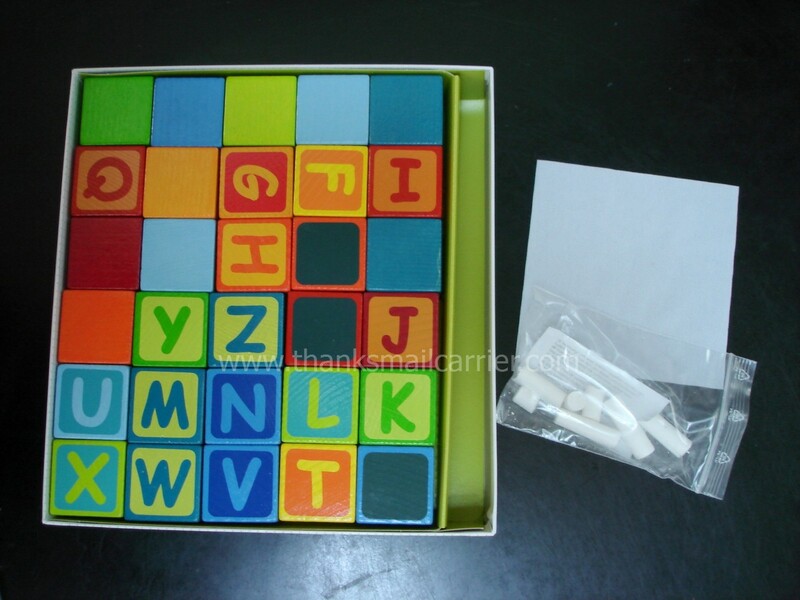 Of their long list of 2011 additions, when the Building Blocks First Letter Fun arrived, I knew that HABA was going to make this a season to remember. 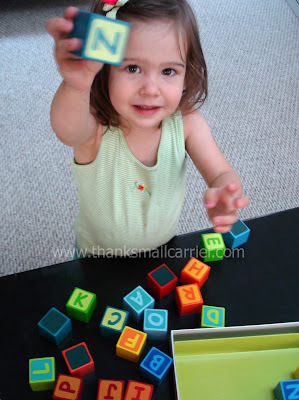 Combining a child's love for building with the ability to explore the universe of letters and words, Building Blocks First Letter Fun contains 26 letter blocks, four chalkboard blocks, two pieces of chalk and one cloth/sponge eraser for ages 2-6 to get right to work constructing. The simplicity yet ingenuity of these blocks is great! Made from sustainably managed forests, these beechwood blocks are decorated with non-toxic water based stain so, as with all of HABA's high quality products, they are completely safe for kids. 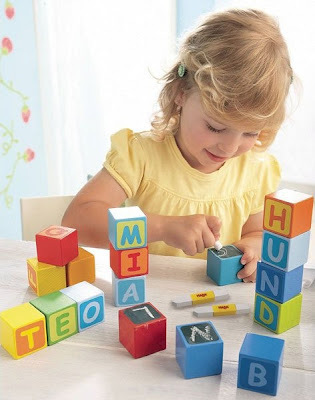 The letters are printed on one side of the letter blocks, making it easy to get started right away building vertically or horizontally and focus on either the fun of the tower or the fun of the word. Both Big Sister E and Little Sister B were immediately attracted to the vivid, bright colors and went right to work constructing to see just how tall they could get these blocks to go. But the letters didn't go unnoticed and it wasn't long before we were talking about each one, the sound it made, and what words we could make by pairing it with others. 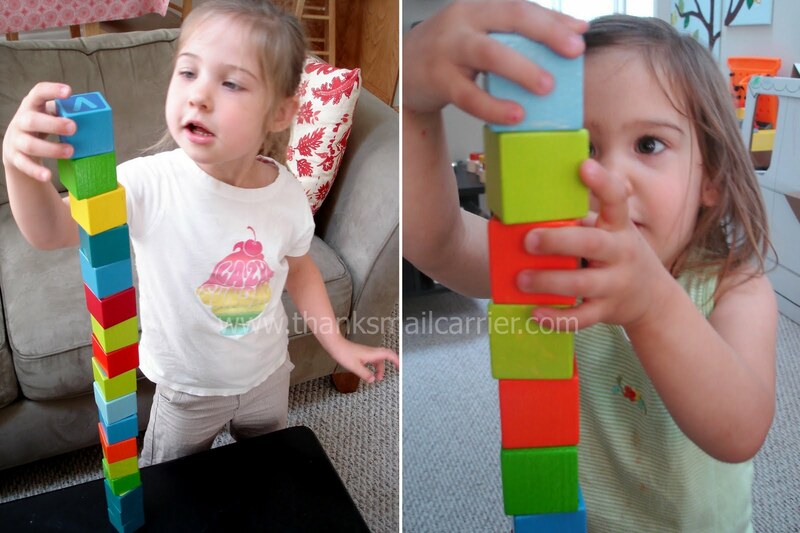 What a great way to include an educational aspect while stacking! 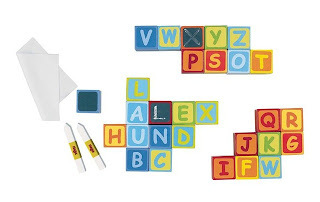 By taking alphabet blocks one step further and including the four chalkboard blocks, however, HABA made it possible to do more than just letter recognition by creating even more words while practicing handwriting. 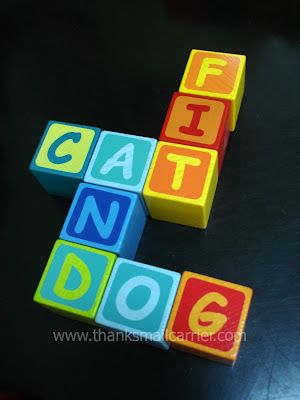 Kids are able to really work on spelling, problem-solving (figuring out which letter is missing), and more... each time these blocks are brought out it is a whole new experience! HABA was already a trusted name in our house for quality wooden toys, but Building Blocks First Letter Fun has enforced that even further! I love that my kids can be creative with both their minds and their hands and that this is a set that could be used by young children (just leave out the chalk until they are old enough) and still bring interest and use throughout the rest of childhood. I have no doubt that we'll be playing with these for years to come! 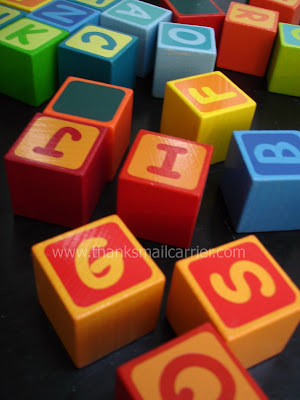 One lucky person will win a set of Building Blocks First Letter Fun from HABA! To enter to win: Visit HABA and tell me another of their amazing items that you would like to own. 1 Extra Entry if you Like HABA on Facebook. Giveaway will end on September 21st at 11:59pm CST. Do me the favor of leaving an email address or making absolutely sure it is visible in your profile, I have to have a way to contact the winner. The winner will be chosen by random.org and announced here as well as emailed and will have 48 hours to contact me or respond to notification or a new winner will be chosen. This giveaway is open to U.S. residents only. A big thank you to HABA for providing a set of Building Blocks First Letter Fun for me to review as well as for one lucky giveaway winner. The opinions shared are my own and honest and if you really need to see more, click here to see how I roll. So hard to choose! It was a toss up between Pattern Mosiac or Animal upon animal. Pattern Mosaic would have so many pieces to get scattered all over the house, but again, that toy would age with my children much better than the animal upon animal game. We would love to win these blocks...the wooden scale is also real cute. I also like their Pushing Animal Chris Croak toy. I'd love to own the Ball track Sounds Starter set. I think I'd have as much fun as my daughter with it. I'm a facebook fan of HABA under username Jennie Tilson. cute stuff! I like the Haba food items... especially these lollies~ http://www.haba.de/haba/produktAnsicht.htm?c=PC_P_001509&twk=TW_P_Knabbereiensuessigkeiten_KaufladenRollenspiel&hk=HK_P_Kaufladen&rk=Produkte my daughter would love them! I entered the CleanItSupply.com giveaway. I entered the Ragu giveaway. I entered the Havianas giveaway. I entered the Purse Bling giveaway. I would like to own their wooden train. My son would love it. Terra Kids - Where do the animals live? The Pirate & Mermaid Bath sets are adorable!!! I love the ball block set! Would love to own their ice cream shop! my kids love pretending they are making and eating ice cream. HABA toys are awesome and so GREEN! I love the Lilo and Tom in Habaland toy! HABA has many awesome toys we would love! Following on Twitter as catholicfanatic. The mixer role play set at Haba is too cute! I liked Thanks, mail carrier on FB. I like the Play rug Discoverers' Meadow. My toddler would LOVE this push Fire Engine car. I think that is a good remember for Christmas!